Chamomile tea is one of the most popular teas and for good reason. It has a deliciously smooth flavor profile and extensive research showing health benefits ranging from improving your immune system to lowering your risk of heart disease. Used in modern times in everything from skincare products to cosmetics to aromatherapy, chamomile tea contains powerful ingredients for an array of uses. Known most commonly as a tea for relaxation and unwinding after a long day, chamomile packs a punch when it comes to keeping your mind and body healthy. Chamomile tea is not a true tea, but rather an herbal tea or tisane made using flower petals. Consumption of chamomile tea is steeped in a history that dates back to ancient societies, which used both fresh and dried flowers for a variety of reasons. The taste profile of chamomile is subtle and pleasing to most palettes. 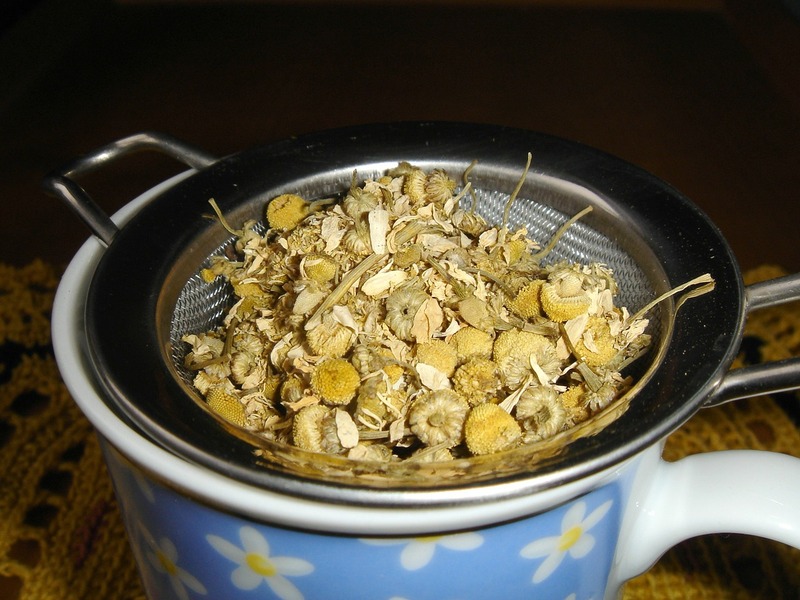 There are two main types of chamomile tea including German Chamomile and Roman Chamomile. The use of chamomile tea dates back to Ancient Egypt where it was used to treat fever and as an early cosmetic (1). Romans used chamomile to add flavor to beverages and as a medicinal herb to cure an array of ailments. Chamomile was used in Medieval times to add an aromatic scent to public events by sprinkling the fresh leaves around. Perhaps most interestingly, chamomile was used in beer production to add flavor, much in the same way hops is used today. Chamomile tea comes from the daisy-like flowers of the plant family Asteraceae, which also includes flowers such as sunflowers and marigold. Chamomile is made using an infusion of the flower petals and hot water. Chamomile is naturally caffeine-free, lending to its common use at bedtime. 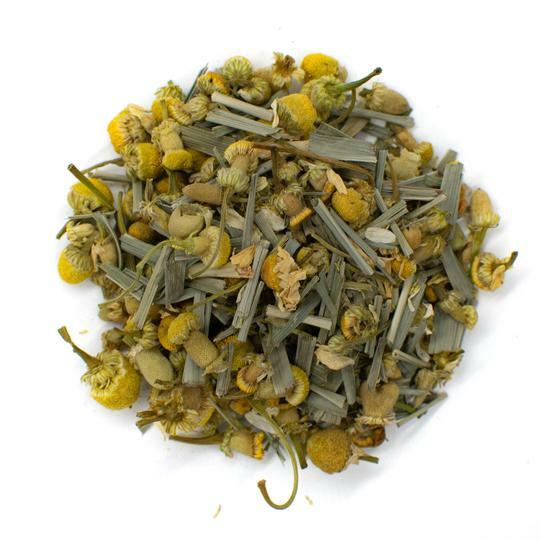 Chamomile has a flavor profile that consists of herbal and fruity notes with a refreshingly smooth finish. Often compared to the taste of a crisp apple, chamomile derives its name from the Greek words “chamai melon,” meaning ground apple (2). The light, airy taste is almost universally appreciated and also has a sweet aromatic scent. Chamomile tea is light when brewed, invoking notions of soft sunlight that pair perfectly with its healthy mind and body benefits. One of the most common reasons for tea consumption is the powerful ability of its ingredients to aid in relaxation. Chamomile tea can help reduce stress and anxiety thanks to its warm, soothing nature. For the best results, drink one to two cups of chamomile tea daily or when feelings particularly stressed out. 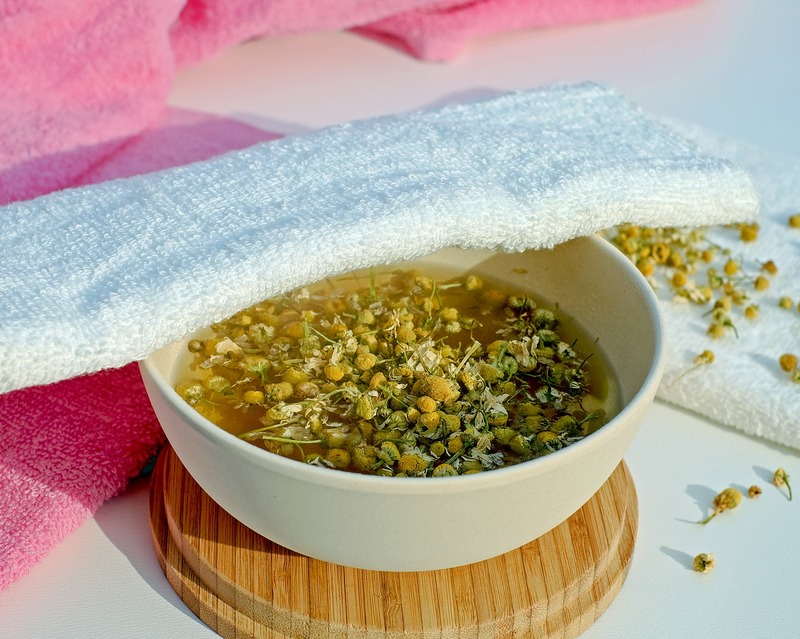 In an article published by the Holistic Nursing Practice Journal, author Stephanie Ross detailed the effects of chamomile on soothing the mind. She states that chamomile tea increases serotonin and melatonin in the body, two hormones that work to alleviate feelings of stress (3). By increasing these hormones, you can relax more easily and let the stress of the day slip away. A 2002 article published in the Vegetarian Times demonstrated that chamomile can ease tension that is often associated with migraines and headaches. Chemical compounds and antioxidants in chamomile tea works to open up blood vessels and reduce inflammation that can constrict and lead to pounding headaches and intense pain. The reduction in inflammation can also help to alleviate aches and pains such as muscle spasms and menstrual cramps (4). Just as relaxing compounds in chamomile tea help to alleviate stress and anxiety, they also aid in helping you get to sleep faster and achieve a more restful repose. Chamomile tea induces sleep for people who suffer from sleep disorders such as sleep apnea and insomnia as well as for people who struggle to relax enough to fall asleep. A 2015 study published in the Journal of Advanced Nursing demonstrated the effects of chamomile tea on sleep quality and depression. The study consisted of a group of 80 Taiwanese women who claimed to have poor sleep quality. The women were divided into two groups, a control group and an experimental group, which drank chamomile tea for 2 weeks. The experimental group scored significantly lower when it came to reporting sleep inefficiency compared to the control group (5). While chamomile can aid in better sleep, most studies show results that are in the short term rather than the long term. This means the efficacy of chamomile as a treatment for long-term depression is less effective than its use to induce restful sleep right before bed. As restful sleep is linked to the prevention of a host of diseases, enjoying a cup of chamomile tea before bed can help ensure your overall health. Drinking chamomile tea can have extensive health benefits for your mind and body, but it can also be used topically to treat skin conditions. Often used in baths to treat itchy, scaly skin, chamomile tea can also be applied directly to the skin for healthy skin benefits. Chamomile tea has anti-inflammatory and antioxidant properties that can relieve skin irritations such as eczema and rosacea. The natural polyphenols and phytochemicals in chamomile tea can speed up the healing process of scars and minimize wrinkles and breakouts (6). The polyphenols work mainly to eliminate free radicals that cause premature aging. Chamomile tea can help resolve digestive tract problems such as irritable bowel syndrome along with upset stomach and abdominal pain. Traditionally used to treat colic in children, chamomile is also exceptionally good at relieving gas and preventing stomach ulcers. A study published in Phytomedicine demonstrated that a formula of chamomile flowers, peppermint leaves and licorice root among other ingredients helped to prevent the development of gastric ulcers. The compounds and antioxidants in the chamomile formula reduced acid output and decreased leukotrienes, which can cause ulcers (7). Anti-inflammatory properties in chamomile have also been credited with preventing diarrhea. One animal study examined the use of chamomile in Tunisian medicine to prevent diarrhea. The researchers gave mice chamomile extract before inducing diarrhea using castor oil. The mice who received chamomile as a pre-treatment showed lower levels of digestive problems (8). While many of these studies are ongoing, there is reason to believe chamomile can help regulate the digestive system. To get the most out of these health benefits, consume a cup of chamomile tea 30 minutes before each meal. Another one of chamomile tea’s most heralded health benefits is its ability to help boost your immune system to prevent the common cold and fight the flu. The aromatic scent of chamomile helps to clear congested sinuses, and the anti-bacterial properties work to defeat any unwanted bacteria and viruses that wreak havoc on your immune system (9). Chamomile's soothing properties can also help alleviate symptoms of sore throat. A study conducted by the American Chemical Society analyzed the effects of regular chamomile consumption on 14 volunteers. 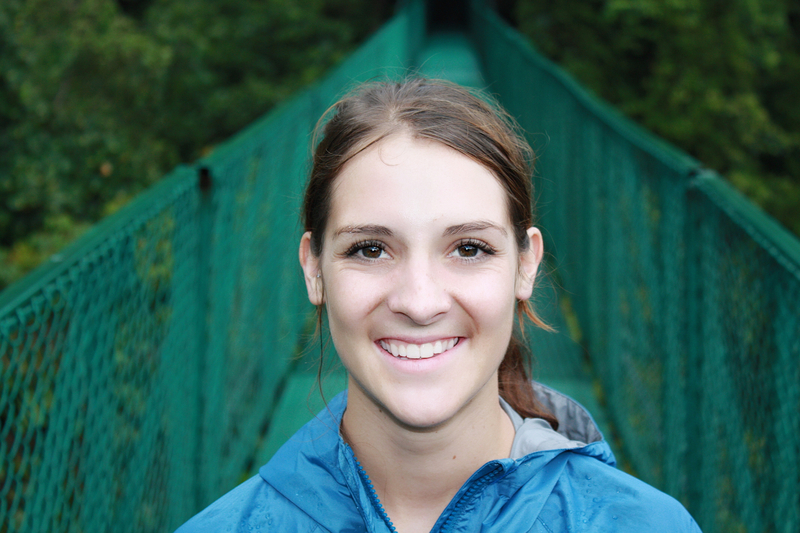 The volunteers drank five cups of chamomile tea every day for two weeks and submitted urine samples each day. At the conclusion of the experiment, participants had higher levels of hippurate and glycine, which have been associated with antibacterial activity (10). Scientists believe there is a connection between the polyphenols present in chamomile tea and the improved immune system results of regular tea consumers. While more studies are needed to identify the definitive link, drinking a few cups of chamomile tea per day can set you on your way to better immune health. As a leading factor of death in the United States, heart disease is on the rise due to poor dietary choices as well as smoking and hereditary factors. Fortunately chamomile tea can help to keep your heart healthy. Studies have shown that chamomile can help lower blood pressure and bad cholesterol known as LDL cholesterol (11). One such study took a group of 64 individuals between the ages of 30 and 60 and divided them into experimental and control groups. The experimental group consumed chamomile tea three times per day immediately after each meal for eight weeks. Those who drank chamomile tea showed significantly lower levels of serum insulin levels and insulin resistance related to diabetes (12). In a review published in Nutrition Review, scientists examined 20 studies looking to connect the consumption of flavonoids with a lower risk of cardiovascular disease. The review found that flavonoids present in tea were shown by the majority of these studies to reduce the incidence of heart disease in European and American populations (13). Another topical use of chamomile tea is to promote healthier, shinier hair. Anti-inflammatory compounds can alleviate itchy, dry scalp that can lead to dandruff. Chamomile tea is also a natural hair lightener so you can achieve lighter hair or highlights by applying the brew to your scalp. 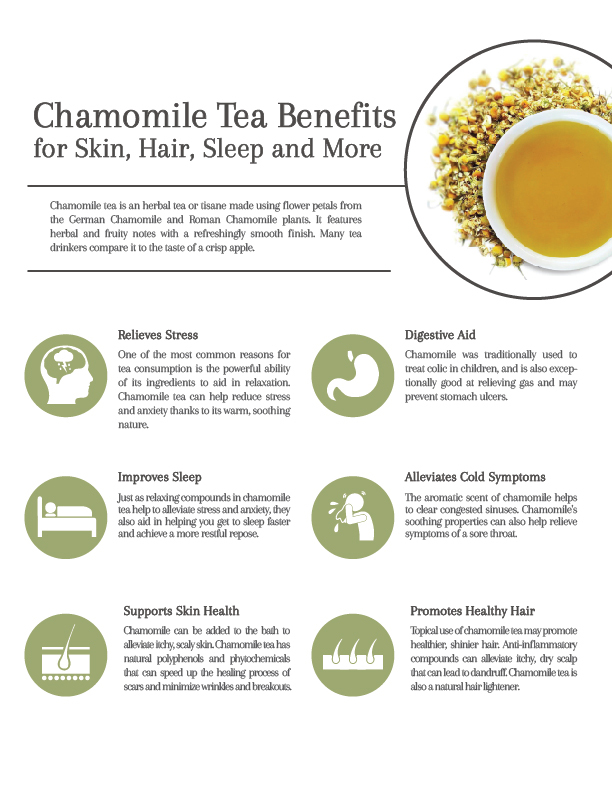 To get these benefits, simply rinse your hair with cold chamomile tea in the shower. Chamomile tea is a fairly safe tea for the majority of the population to consume. There are, however, a few things to keep in mind including the amount you should consume and potential side effects. Chamomile also has sedative effects so that should be considered. 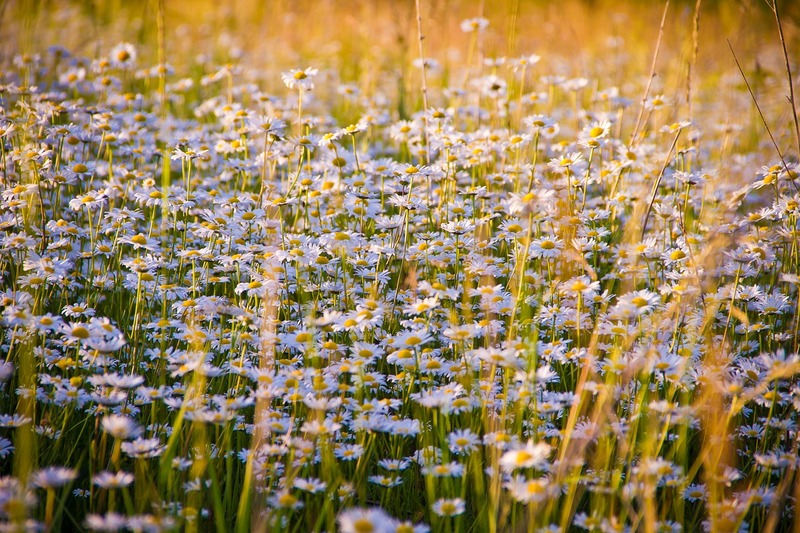 If you are allergic to flowers in the daisy family, you want to be careful consuming chamomile tea. 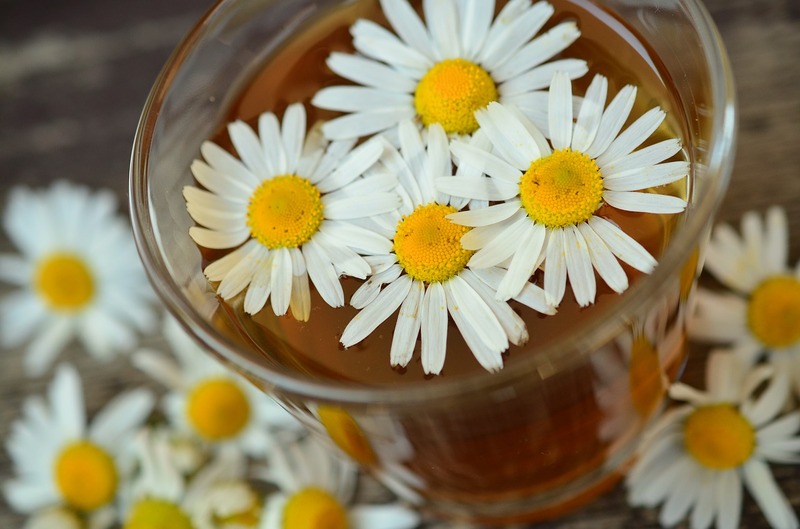 Chamomile tea should be avoided if you have allergic reactions to chamomile, chrysanthemums, daisies, marigolds and ragweed. Chamomile has small amounts of coumarin, which can act as a blood thinner. 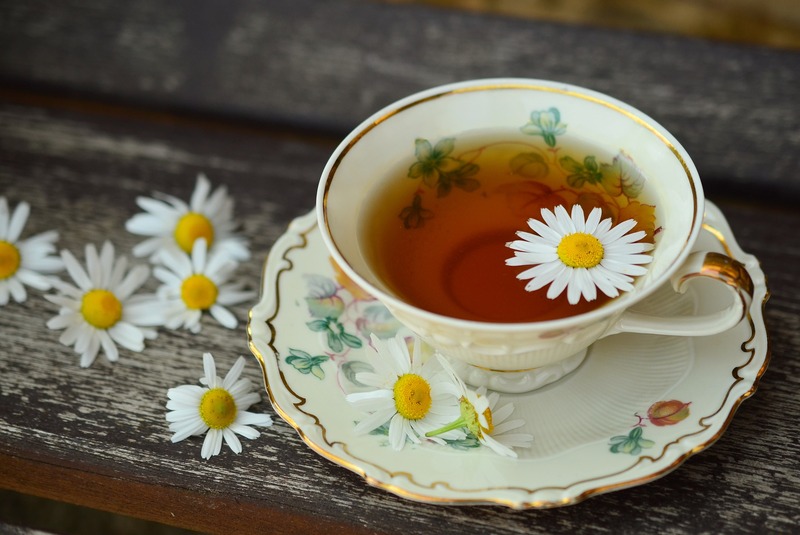 While typically only problematic in high doses, you should avoid drinking chamomile tea two weeks before surgery to avoid interactions with drugs. Since long-term effects on chamomile and pregnancy are still in the infant stage when it comes to research, it is usually recommended to avoid chamomile while pregnant. You should consult with your physician before taking chamomile in conjunction with pregnancy or with supplements and medications. Chamomile tea can be prepared using fresh flowers from your garden, dried petals or a tea bag from your favorite tea master. While instructions can vary slightly for each method, in general you should abide by the following steps. If using fresh flowers, you may want to opt for a tea infuser or use cheesecloth to create your own DIY tea bag. Fresh flowers should be removed from the stem. You can also boil the flowers in a pot and use a strainer when you are ready to serve into a cup. 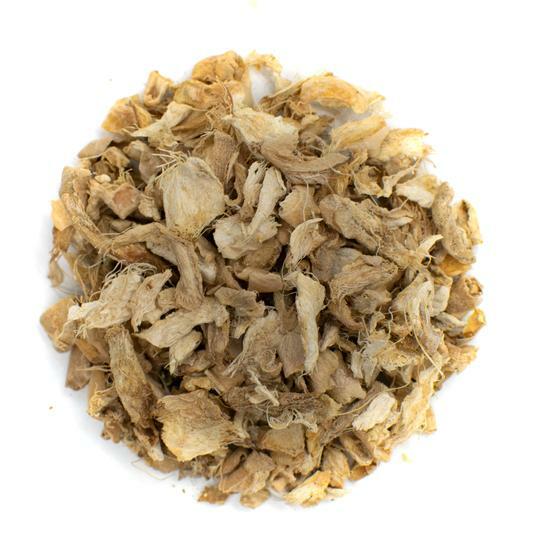 For dried chamomile flowers, use 1 heaping teaspoon for every 8 ounces of water. For fresh flowers, use 3 to 4 teaspoons per every 8 ounces of water depending on preferred brew strength. Chamomile tea flavors develop best when brewed using hot water. You should aim to heat your water to 200 F before adding loose flowers or a chamomile tea bag for steeping. To get the maximum health benefits from your cup of chamomile tea, aim to steep flowers for 3 to 5 minutes. 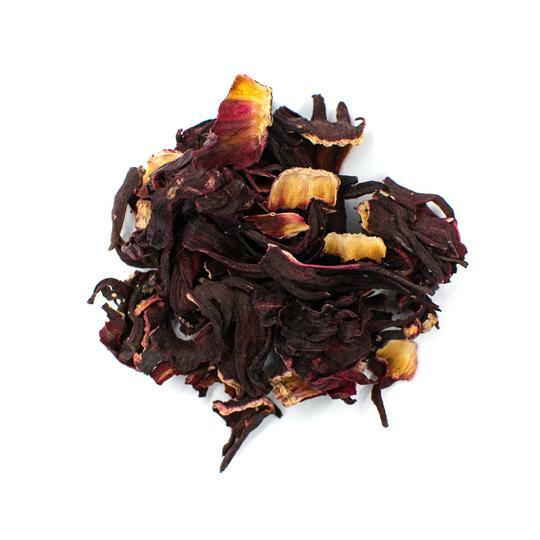 You can typically get anywhere from one to three infusions using the same flower petals or tea bag. Consume chamomile tea as is to get the most natural flavor profile. If preferred, chamomile tea benefits from a dash of honey or a fresh slice of apple to further develop the sweet, crisp flavor profile. The light, warm, sun-kissed color of chamomile tea paired with a delicate fruity flavor profile and sweet scent makes drinking chamomile tea the perfect solution to a tiring day. Far beyond its benefits for relaxation, chamomile tea helps boost your immune system, keeps skin looking flawless and promotes a healthy heart and digestion. Brew a warm cup of tea before bed to enjoy unwinding after a day at the office or start your morning with a moment of zen and a cup of chamomile tea.